more art | art by mags! 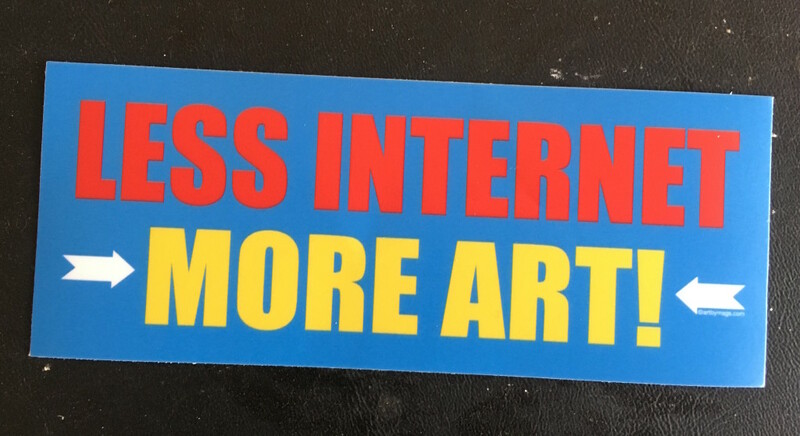 LESS INTERNET, MORE ART! is a slogan i’ve been using for years. i just randomly said it to myself one day when i was noticing how i get sucked into social media on my computer, so i made a stencil and used it to make signs on wood that i used to sell when i did the art markets around town. (one hangs in my bedroom still to this day.) i revisited the design recently when i was doing a brief facebook fast and decided it had to be my next sticker. these are professionally printed by stickermule.com and are excellent for outdoor or indoor use. they measure 5″ x 2″ so they are a good display size, and the colors absolutely pop on these! mine is already on my car bumper! use this handy paypal “buy now” button below to order yours now! and don’t forget, the last night a brass band saved my life stickers are still available too! or if that doesn’t work for you, you can paypal me $ at: paypal.me/artbymags.